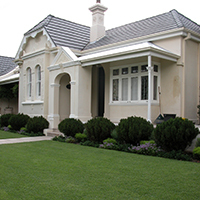 Groundcovers and low growing plants are needed in almost every landscape. Low growing plants are perfect alternatives to lawns and can be planted on mass without looking too overbearing like some larger plants would. It’s even more important for them to be drought tolerant if the plants are mass planted. Below are two drought tolerant, low growing plant categories to easily fit into your landscape with a mixture of shrubby groundcovers and strappy leaf plants. Click on the links to see more information on each plant. Yareena™ Myoporum parvifolium ‘PARV01’ PBR: 10cm H x 1m W.
Crisp, clean foliage and longer lived Myoporum. Handles frosts and drought much better than other forms. Themeda australis ‘MINGO’ PBR: 15-20cm H x 60cm W.
Blue foliage, native grass groundcover. With some maintenance this grass looks much better than if left alone. Double Gold™ Gazania hybrid ‘GT20’ PBR: 20cm H x 1m W.
A sterile Gazania that doesn’t spread from seed and has double the flowers compared to most other Gazanias. Purple Fusion™ Scaevola humilis ‘PFS100’ PBR: 20cm H x 1.5m W.
Flatter growing Scaevola that flowers for almost the whole year if there aren’t heavy frosts. This species is much more drought tolerant than the aemula species. 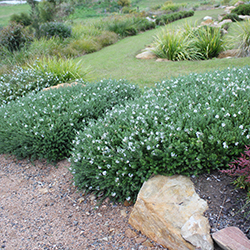 Grey Box™ Westringia fruticosa ‘WES04’ PBR: 20-40cm H x 20-40cm W.
Drought tolerant alternative to English Box. Beautiful silver/grey foliage with white flowers. Grows into a natural ball shape and can be pruned down to 20cm x 20cm. Aranda™ Dianella caerulea ‘DC150’ PBR: 25-30cm H x 35cm W.
Very compact Dianella with deep glossy green foliage. Clumping form with slightly arching foliage. Pure Blonde™ Liriope muscari ‘LIRBLONDE’ PBR: 30cm H x 40cm W.
Great to make a statement for sheltered and shaded positions. Can handle full sun but protect from windy aspects. Pure Blonde shoots blonde new growth in spring and will be completely Blonde if cut back in July. Drought tolerant strappy leaf plants are widely used in harsh climatic conditions in hot parts of Australia and the USA. Breeding has improved these ornamental grass like plants so now they are much more beautiful for home gardening and commercial landscapes. Best of all they are evergreen. It’s hard to believe that the girl shown here kicking her soccer ball in the backyard is playing on a locally developed Australian turf grass. This lush, green lawn is Nara™, a form of Zoysia macrantha. It was bred in Australia to cope with local conditions. As well as coping with the hot dry summers, Nara™ is a lawn grass for garden owners who don’t have time to lavish on lawn care. Given a minimum amount of fertiliser, Nara™ survives and remains green without needing constant mowing. With a more frequent fertiliser regime and regular water, it becomes greener and lusher. Nara™ has resistance to most lawn diseases and its strong, dense growth helps keep it weed free. If it does develop a problem, products used to treat pests, diseases and weeds in couch can be used safely on Nara™. Nara is one of a couple of Zoysia turf grasses finding favour in Australia. Another variety is Empire, a form of the closely related Zoysia japonica. According to Todd Layt from Ozbreed who bred Nara™, it responds well to different levels of care. “Nara™ really is versatile,” says Todd. “It grows in most areas in half shade or full sun, with drought or wet conditions and can be mowed short or long. ” “Indeed we find it requires less frequent mowing than most of the traditional lawn varieties, particularly through summer,” he adds. Australia is a really tough place to live at times, and we live in shelter. Imagine with the severe drought, heat and high winds of late how hard it is for plants to live. It’s important to choose tough drought tolerant plants. Many of Ozbreed’s plants fit this brief, but just remember in times like this if you have to establish them, they are going to need lots of water make it through the first part of their life. In conditions like these even drought tolerant native plants need top up water to remain healthy. You have to feel for all the Landscapers, and gardeners trying to get plants and turf to take in these conditions. Months of no rain, wind and heat. If you are installing turf and plants don’t skimp on the irrigation for the first 2 months, and in conditions like these, maybe 3 to 4 months. PS. Wishing good luck to all those people effected by the fires. Lucia™ is a spreading form of Dianella caerulea. So if you need a drought tolerant plant that gets thick and outcompetes weeds well, Lucia™ Dianella is it. It makes a wonderful roadside plant, or erosion control plant, and its masses of mulberry coloured flowers make it great for any garden. It is very humidity tolerant, yet can cope with frosts down to Minus 7 degrees Celcius. It can tolerate a wide array of soil types, but performs better in soils of at least reasonable quality. In general soils it will grow to a smaller height (just under knee high) but in really good soils it will reach 50 to 60 cm high. It’s a great plant for coastal windy areas, and also for hot dry or humid inland areas. Lucia™ Dianella is just a no fuss, easy care reliable plant.